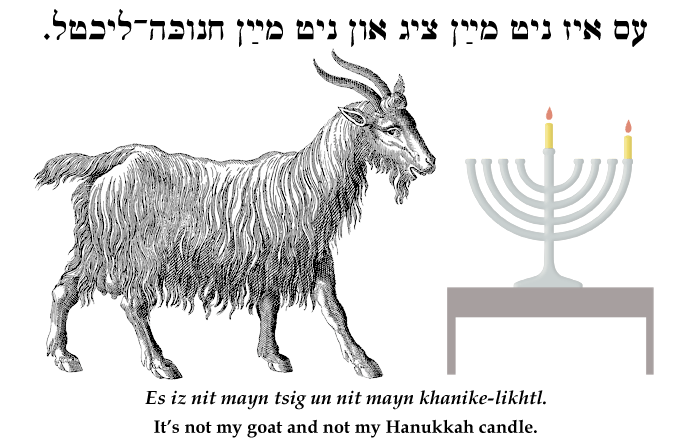 Yiddish idiom: It's not my goat and not my Hanukkah candle. ‏‎עס איז ניט מײַן ציג און ניט מײַן חנוכּה–ליכטל. Es iz nit mayn tsig un nit mayn khanike-likhtl. It's not my goat and not my Hanukkah candle. It's none of my business, not my problem. SOURCE: Stutchkoff, Der Oytser fun der Yidisher Shprakh.